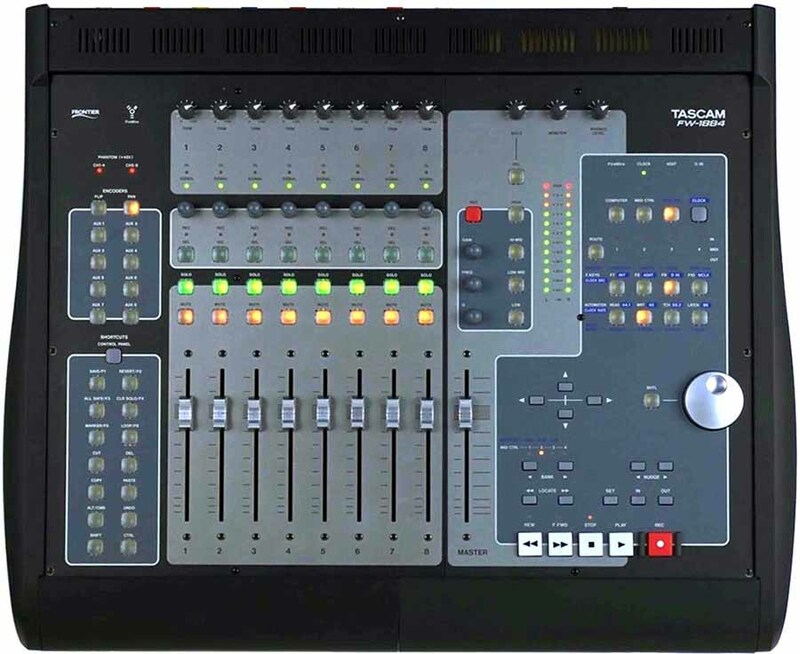 interface; combining IEEE 1394 (FireWire) high bandwidth data transfer, a fully featured 18x8x2 audio mixer,incorporating many of the leading performance featuresof TASCAM's DM-24 mixer,and sophisticated DAW control surface. faders (eight channel and one master fader) 11 dedicated (4-band parametric) EQ,Pan, Solo, Mute Select and Aux send rotary encoders, transport controls, aprofessional, weighted jog shuttle wheel and an array of assignable function /short-cut keys, for flexible control of the widest possible range of dedicated audiosoftware programmes. A FAT Channel provides for adjustment and representation of EQ, dynamics and effects parameters. high quality microphone pre-amps, 24/96 AD / DA conversion throughout and 96 kHz operation on all analogue I/O channels, a full compliment of eight analogue microphone/ line inputs , with phantom power and inserts on each input; 8-channel ADAT and stereo SPDIF digital I/Os. 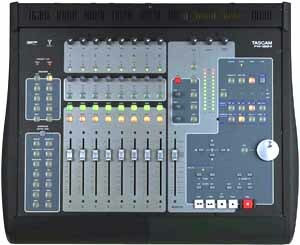 In use, the FW-1884 allows access to up to 18 audio inputs at one time. Eight analogue outputs enable simultaneous monitoring of stereo and 5.1 multi-channel audio. A 4x4 MIDI interface/ patcher is also featured. Connection to hostcomputer platforms is via either of two high-speed IEEE 1394 (FireWire) interfaceconnections. Word Clock I/O ensures accurate synchronisation within the digital signalchain. An assignable footswitch jack facilitates such operations as hands-freepunch-in recording or MIDI control. Software support is for Windows 2000,Windows XP, Mac OS-9 and Mac OS-X with ASIO, WDM, MME and GSIF drivers,enabling control of major workstation packages such as Protools, Logic, Nuendo/Cubase, Digital Performer, Pyramix, Soundscape, Samplitude, Sequoia. The FW-1884 also features emulation of the control features of the Mackie Control toenable immediate use of the FW-1884 with software that supports the Mackie Controlbut does not yet support the FW-1884. Further system expansion is possible with the FE-8 expansion module, providing eightassignable encoders and keys.